The Best Electric Guitars Under $300 in 2019: reviewed and rated! It can be tough to find the best electric guitar under $300, but no matter how difficult it is to get a good deal on a quality guitar, it’s very much possible. Coming up are five great electric guitar models from four trusted brands: Epiphone, Ibanez, Squier and Dean. Epiphone, as many know, is a subsidiary of Gibson while Squier is under Fender. Both offer pocket-friendly versions of their Gibson- and Fender-branded counterparts, delivering the same quality at a lower price. Ibanez and Dean offer guitars at different price tiers so we’ve picked out the best for this price category. 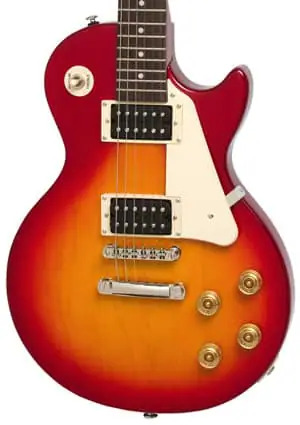 Epiphone Les Paul 100 Electric Guitar With a mahogany body, maple top, bolt-on mahogany/okoume neck, 700T/650R humbucker pickups plus other great specs on board, it’s hard to imagine how the Epiphone Les Paul 100 is priced under $300. This budget-friendly Les Paul is perfect for beginners searching for an affordable yet good-quality starter guitar as well as pro-level guitarists looking for a reliable backup. Ibanez RG421 Electric Guitar Another great electric guitar under $300 is the Ibanez RG421. This Ibanez model has a mahogany body and a Wizard III maple neck with a jatoba fingerboard, delivering a rich, warm yet punchy tone. The sound is clearly captured by two Ibanez Quantum series humbucking pickups. It also has a fixed bridge and is available in sunburst and metallic finishes. Epiphone Les Paul Studio Electric Guitar How about another Les Paul? This time it’s the Epiphone Les Paul Studio, which boasts a no-frills look but the same Les Paul sound. Based on the classic lightweight Studio from the ‘80s, this LP features a mahogany body and neck, Alnico Classic Open-Coil humbuckers and a LockTone Tune-o-Matic bridge and stopbar tailpiece. For the price, this is a steal. Squier Vintage Modified Mustang Electric Guitar Gibson’s got Epiphone and Fender’s got Squier to supply us with affordable electric guitars. For our next pick, we have the Squier Vintage Modified Mustang. Short in scale at 24 inches, the Vintage Modified Mustang is of a size friendly to beginners and players with smaller hands. It’s got a basswood body, a maple neck and Duncan Designed single-coil pickups. 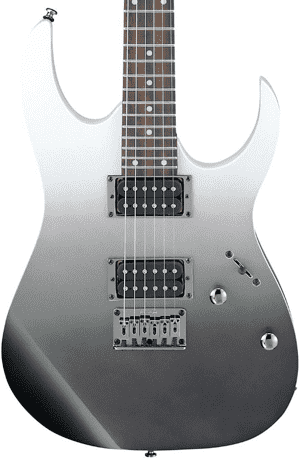 Dean MLX Electric Guitar Our last pick is the Dean MLX. Part of the X series, this electric guitar has the distinctive ML body style and a V-shaped headstock. The MLX has a lightweight basswood body, a sturdy bolt-on maple neck, Grover tuners and two Dean standard humbucking pickups. Each humbucker has its own volume knob but both share the same tone control knob. A lot of us grew up wanting to have a Les Paul guitar of our own, but back then it’s quite out of reach because of budgetary constraints. Now, thanks to the Epiphone Les Paul 100, we can have the classic Les Paul sound and feel without breaking the bank. This guitar is built to the same specifications as the original 1952 Les Paul. The Epiphone Les Paul 100 can be your first electric guitar or the next addition to your arsenal with its pocket-friendly price tag of under $300. This guitar has a mahogany body with a maple top and either a mahogany or okoume neck depending on availability. The neck has a bolt-on construction for sturdiness, a brighter sound and a greater articulate response. This Les Paul also has a 24.75-inch scale length, which is considered to be short-scale. Therefore it’s ideal for beginners and players with limited reach. The fretboard is made of granadillo, also called Mexican rosewood as its tone is similar to that of rosewood. The Les Paul 100 is equipped with a 700T humbucker pickup at the bridge and a 650R pickup at the neck, with a volume and tone control for each. Another excellent piece of equipment that won’t put you in severe debt is the Ibanez RG421 electric guitar. One of its highlight features is its Wizard III neck made of maple. What makes Wizard necks great is that they’re designed for speed and playing comfort with their slim neck profiles. They also have jumbo frets, which makes bending strings a whole lot easier. The Ibanez RG421 is part of the best-selling RG series of solid-body electric guitars. The RG guitars are tailored toward those who mostly play hard rock and metal. Common among models in this series are an offset double cutaway design and a flat, wide and thin neck. The shape of the guitars is similar to the Fender Stratocaster, only the horns are thinner and have a pointier end. The Ibanez RG421 also has a mahogany body and a jatoba fingerboard, producing a warm and punchy tone with good sustain. The pickup configuration is HH, with Ibanez Quantum humbucking pickups at the neck and bridge. This Ibanez electric guitar also has a fixed bridge for better sustain and ease of adjustment and maintenance. No matter your skill level, you will have no trouble playing this guitar at all. In 1983, Gibson introduced the Les Paul Studio, which was similar to the Les Paul Standard but without the cosmetic features found in upscale models such as body and neck binding and headstock inlays. It also had a slightly thinner body and was lighter in weight. The Studio was designed to be indistinguishable from a Les Paul Standard in terms of sound, so it was intended for studio work. Musicians can reserve their flashier, more upscale guitars for the stage. 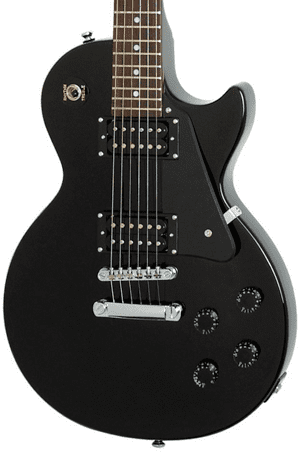 The Epiphone Les Paul Studio is the contemporary and more affordable version of that guitar. For novice players getting a Studio makes a lot of sense, especially since you’re playing mostly at home. It’s also great for those who don’t really want to pay for all the aesthetic extras. The Epiphone Les Paul Studio features a mahogany body with a carved top. The set neck is also made of mahogany and it’s topped with either a rosewood or pau ferro fingerboard with pearloid dot inlays. Pickups come in the form of Alnico Classic open-coil humbuckers designed by Epiphone (standard Alnico Classic at the neck and the Alnico Classic Plus at the bridge). Other features include a LockTone Tune-o-Matic bridge. No money for a Fender Mustang? No problemo! Check out the Squier Vintage Modified Mustang instead. 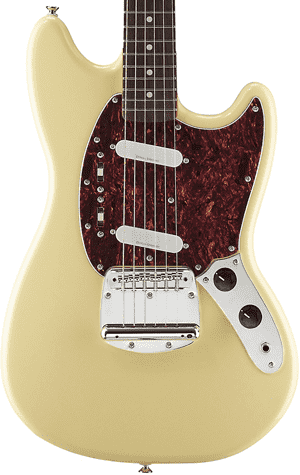 Part of the Vintage Modified series, Squier’s Mustang shares similar specs to the original but uses more modern and less expensive materials. The sound quality, playability, feel and overall performance are not sacrificed in any way. The Squier Vintage Modified Mustang has the same double cutaway shape and compact 24-inch scale length as the classic Fender Mustang. It also has a solid basswood body and a bolt-on maple neck with a C-shaped profile and a gloss finish with a vintage tint. Topping the neck is a rosewood fingerboard with parchment dot inlays and 22 medium jumbo frets. The headstock retains the classic design as well, and even the white-tipped tuning keys sport vintage styling. The guitar also has a floating bridge with a “Dynamic” vibrato tailpiece along with a vintage-style tremolo arm. The Vintage Modified Mustang is equipped with full-sounding Duncan Designed single-coil pickups at the bridge and neck positions. Each pickup has its own on/off phase slider switch so you can choose between lead and rhythm circuits. There are also black-skirted master volume and tone control knobs for total tone tweaking. Finishing off our list of the best electric guitars under $300 is the Dean MLX. With its distinctive ML body shape and headstock, this guitar is definitely something that can grab anyone’s attention. The idea behind the ML’s design is that spreading the mass of the guitar’s body over a wider area maximizes sustain. The Dean MLX sports a lightweight basswood body, a bolt-on maple neck, chrome hardware, a Tune-o-Matic bridge and a rosewood fingerboard with 22 frets and classic dot inlays. The basswood body produces an even tone and is a popular choice among guitarists who play rock and heavy metal. The look of the guitar definitely complements those music styles. The MLX is equipped with two standard Dean humbucking pickups. The black-and-white styling, AKA the “zebra” style, is a nice touch that enhances the look of the guitar. But there’s more to the looks of the humbuckers, as these can provide plenty of low-end as well as midrange definition. They’re definitely more than adequate for modern playing styles. The pickups are wired to a three-way selector. There are individual volume knobs for the pickups and one master tone control knob for both. Grover tuners keep everything in tune. In many cases, the foremost deciding factor is the amount of money you can and are willing to spend on a new guitar. Guitar manufacturers produce guitars with varying levels of quality and at different price tiers, so no matter how big or small your budget is, there’s bound to be a model that ticks all of your boxes. A spending cap of $500 is common among many novice and intermediate players who are serious about learning the guitar or improving their skills. However, many fail to consider the costs of buying accessories and equipment. By the time they’re done shopping, they would have spent around $700. Budget blown! It makes sense then that the amount you allot for learning to play electric guitar (or getting better at it) should not only cover the guitar itself, but also the items you would need for it, such as a strap and extra strings. For beginners, an amp, a sturdy guitar case and an instrument cable are absolute must-haves. So – wouldn’t it be better if you could score a guitar that is a lot lower than your spending limit? As much as possible, the cheaper you can go without resorting to a poor-quality instrument, the better, because you’ll be able to have money for other things. Plus, the money you save can then be used for guitar-related expenses down the line, such as component upgrades and periodic checkups by a professional guitar technician. This is why it would be wise to consider adjusting your spending limit on the guitar itself. This brings us to our recommendations for the best electric guitars under $300. At this price tier, you will still have plenty of fantastic options to choose from. Buying the best models in this price range would leave you with more than enough money for future expenses. The Epiphone Les Paul 100, Ibanez RG421, Epiphone Les Paul Studio, Squier Vintage Modified Mustang and Dean MLX are all excellent axes you won’t regret buying. If you’re trying to save money, these guitars are a worthy investment because they’re solidly built and you won’t have to replace them for years – with proper care and maintenance of course. In addition, lowering your guitar budget to $300 would make you appreciate what’s truly necessary in a guitar. A $300 guitar may perform just as well as, or even better than, a $500 guitar, but perhaps minus some cosmetic embellishments or upscale materials. Going for a stripped-down version of an iconic classic may help you better understand that it’s the playing, not the appearance, that matters. This list shows that the best electric guitars under $300 are instruments that are not to be taken lightly. They can definitely take you from beginner to pro. Here’s a quick roundup of our top picks for this price category and what makes them an excellent first, second or nth guitar. ● Epiphone Les Paul 100 – like a ’52 Les Paul, but more affordable. A short scale length of 24.75 inches is friendly to most beginners and players with small hands. A pair of humbuckers contribute to the guitar’s classic Les Paul tone. ● Ibanez RG421 – has a Wizard III neck built for fast and furious shredding. Jumbo frets are there for string acrobatics. Looks like a pointier and thinner Strat, but with two humbuckers. ● Epiphone Les Paul Studio – a stripped-down Les Paul Standard meant to be played where its sound is considered to be more important than its looks: the studio. Of course, no one’s going to stop you from playing it on stage if that’s what you intend it for. Also has two open-coil humbuckers for that authentic Les Paul tone. ● Squier Vintage Modified Mustang – a Fender Mustang but built using less expensive materials. Same short scale at 24 inches, making it a top choice for youngsters and petite players. Duncan Designed single-coils deliver a quality tone. 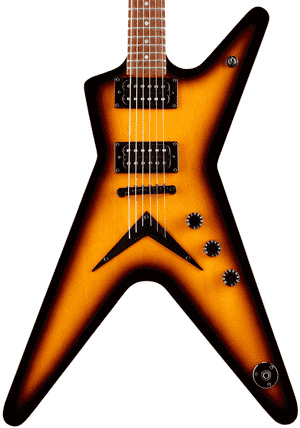 ● Dean MLX – plenty of sustain plus an eye-catching body shape that screams at you, if that makes any sense. Fitted with Dean ‘zebra’ humbuckers for optimum versatility and added visual pizzazz. Find something you like? Go on and check them out! Do more research for your satisfaction (watch those demo videos, read those guitar reviews!) and try out these guitars at music stores if possible. When you’ve made your choice and are ready to shop, we’re sure you’ll already know where you can get the best electric guitar under $300. Have fun!